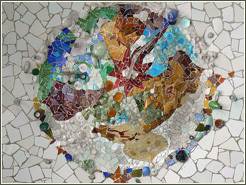 Spectacular mosaics hidden on the ceilings at Gaudi's amazing Parc Guell. WELCOME TO BARCELONA BESO! This personal website is a travel retrospective – a collection of images of Barcelona and many of its most iconic sights. I originally built it for family and friends, inspired by a few months of living there, way back in 2001. But once I got started I also thought, hey, guidebooks don't always give you enough depth. So for curious travelers, I kept adding pages until the site had a wealth of photos and notes – enough to whet any traveler's appetite. Click inside and check it out. FIND YOURSELF UNDER THE CATALAN SUN. I don’t sell anything. I’m not getting paid. I’m just here to tell you from my own experience, time in Barcelona is a tonic for the soul. Sun-drenched, unhurried, funny, lively, often unpredictable and surreal – it’s a place that rarely disappoints for entertainment.